The grand opening of SFO T2 today gave the public a chance to see the new terminal. The first flights from this terminal are not schedule for another week. Since this is a renovation – and not a new terminal – the reveal today was a little underwhelming. The ceilings are low due to the old design and like most of SFO is jam packed with overpriced eateries and retail stores. Thankfully the seating is upgraded and power plugs are easier to find. 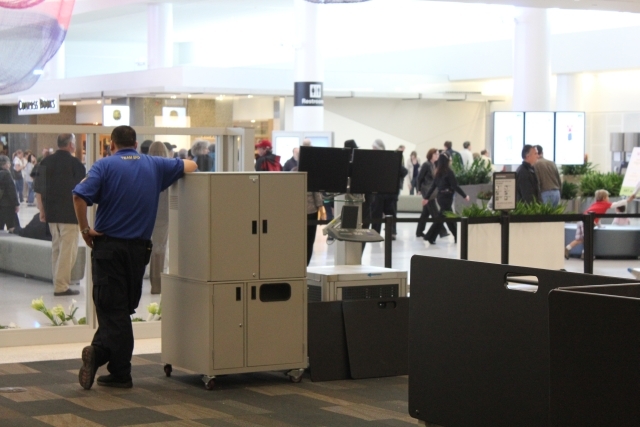 The checkin areas for both American Airlines and Virgin America are spacious and easy to access. Once past security (and the inevitable groping by the TSA/CAS) you can “recompose” yourself in the area immediately past security. Then you are greeted by the Mall Of Amer…. no wait, Terminal 2 shopping.